Jersey is one of the British Isles, the biggest one. It is situated at the North-West side of France and at the South of United Kingdom. Its capital city is Saint-Helier. The island depends on the British Crown however, it is not part of the UK and neither of Europe. In the past, for several times, it used to be a safe escape for French people. Among them , a famous figure of French literature, Victor Hugo. The official languages are English and French. Jersey is well-known for its landscape, close to the sea and its role during World War II. Jersey has a range of things to do at night that suits all tastes. Here are few examples. For pubs and bars, there are The Halkett Pub & Eating House and Koko that is the largest one in the island. For clubbing, you have the Rojo Nightclub and The Havana Club. Apart from those mentioned previously, you have a lot of other places to go where you can eat the speciality of the island, sea foods. Jersey’s capital is a great place to go shopping across pedestrian streets. In those streets, you can even find big stores but also small shops. To buy ceramics and pottery, go to Jane’s working ceramics studio. There are also a lot nice things to buy, you just have to walk through the streets and you will obviously find something to your taste. Noirmont, a war memorial for World War II. It is situated on the headland in the South-West. 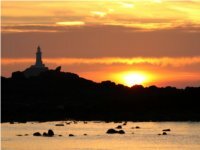 La Corbiere, a lighthouse which was the first to be built in the British Isles. It was raised because the coast of Jersey is very dangerous and rugged. A beautiful place to watch sunsets. Grosnez Castle, historic ruins which used to be a ceremonial site. There you can see all the others British Isles. It is also a place that hosts run meetings during summer. St Catherine, a popular picnic spot. Les Ecrehous, an area where the water is warm and that hosts a large diversity of marine wordlife. The only way to visit is by boat. Seymour Tower, in the royal Bay of Grouville, was built after the failure of the French Invasion in 1782. It also allows people to stay overnight. Jersey has a marine West coast climate. It is mild with no dry season, the summer is warm. The hottest month is August with an average of 21 °C and the coldest is January with an average of 8 °C. The best period to go there is June as the precipitation are rare. How to move in the city ? To visit the city, you can have a walk or go cycling around it. You can get there by plane. In fact, Jersey airport as many links with the United Kingdom but also with Paris and Zurich. From the French and the English coasts, you can take the ferry to reach Jersey but also the others British Isles.